More Fine Fan Art has arrived this week, making me very happy and leaving almost completely unable to draw. This is the creative psychic balance I've been trying to hit; to be in a frenzy of inspiration yet frozen by inadequacy, if that makes sense. First my friend Jack Gartner has caught the tone of the strip perfectly; everyone's off in his or her own little world. 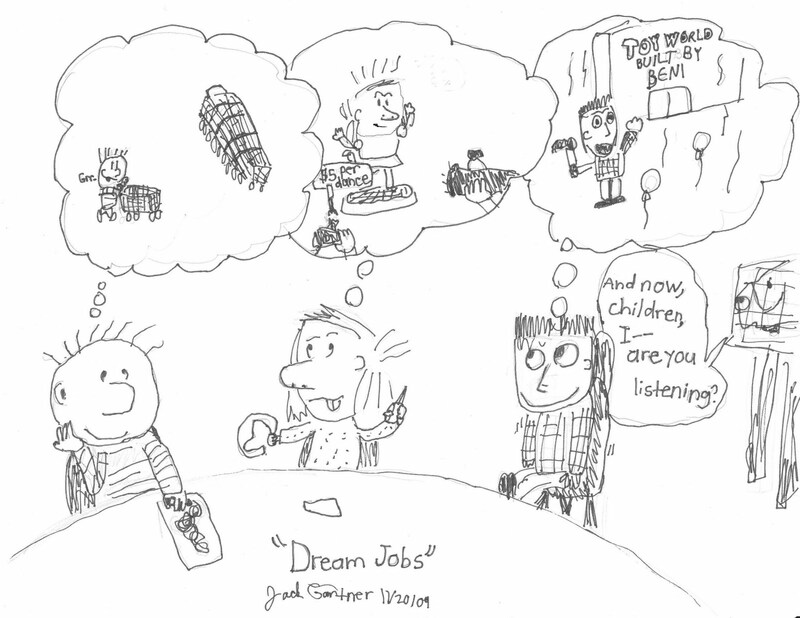 If only they could somehow combine their dreams into one larger dream. Beni builds Toy World, Dill pushes carts in the parking lot, and you have to go through Alice to get inside, probably after an enforced period of watching her dance. And Mr.Danders is being ignored, just like in real life. 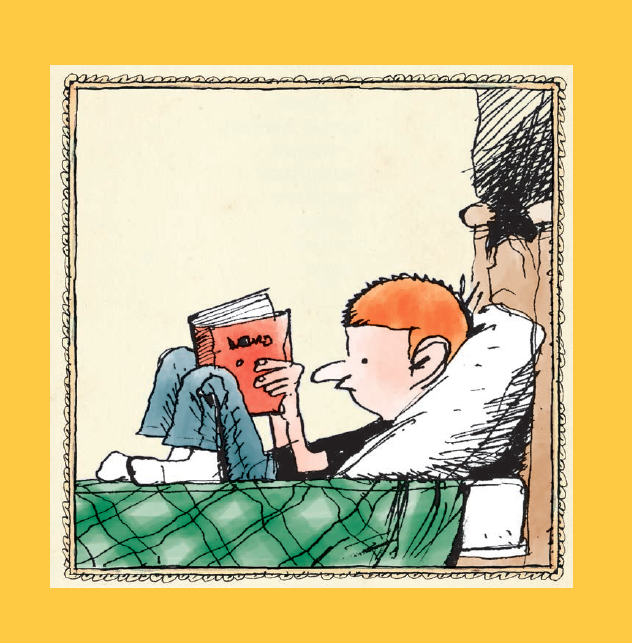 Thanks, Jack, there's a whole Sunday strip right there! 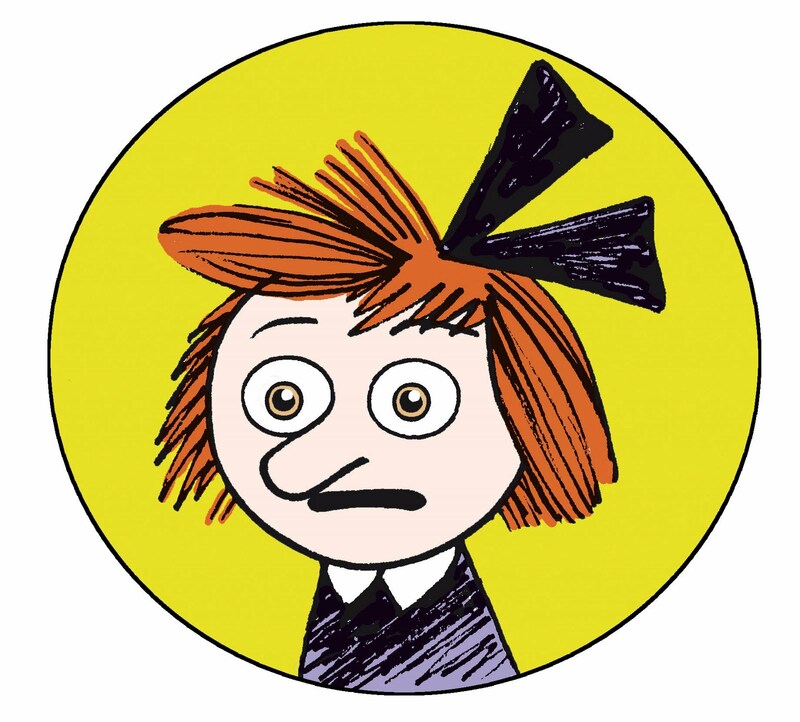 The accomplished cartoonist Melissa Mendes has drawn Alice as she appeared in one of my favorite strips, where Alice changed costumes in every panel*. 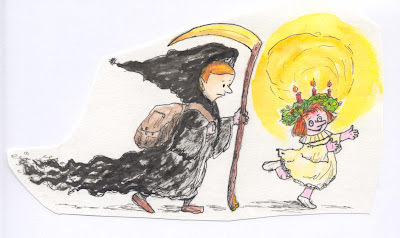 Melissa has a delightful blog where she posts drawings and news from the Center for Cartoon Studies in White River Junction VT. Thank you, Melissa! If this is any indication of how the youth of today are using their education, I say there's hope for the future. Alice enters the third dimension with frightening accuracy thanks to my friend Mark Anderson's dab hand at Legos. Just think how many man hours were involved in this bust that might've been otherwise wasted on something productive. 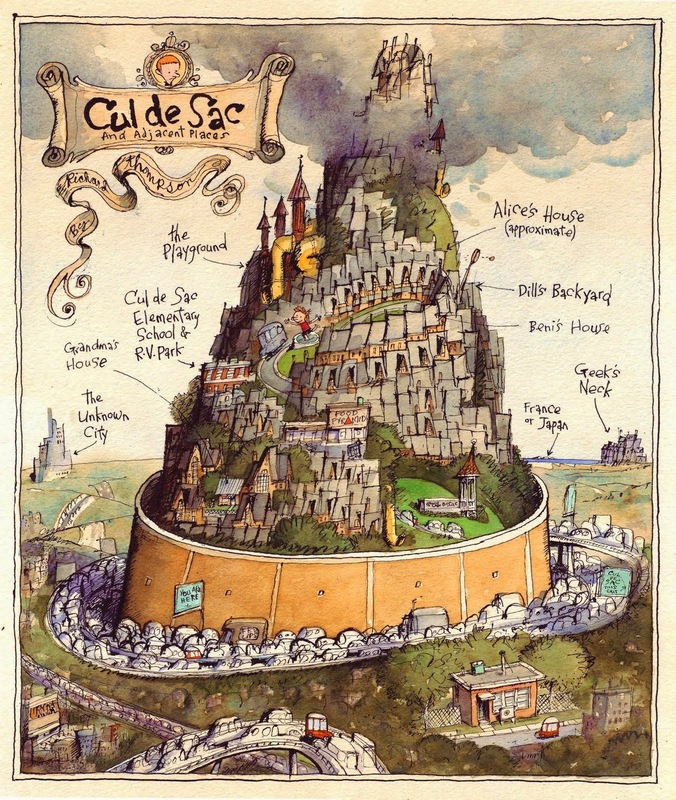 Thank you, Mark, for this investment in Cul de Sac Fine Fan Art! 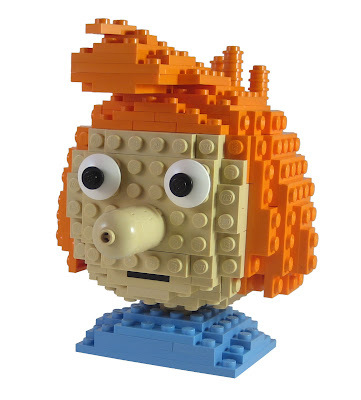 I hope the Lego people see it and market it as a kit. And Mark draws even better than he plays with Legos! There, the gauntlet has been thrown down. Can you create some Fine Fan Art that will match these magnificent offerings? G'wan, I dare ya! 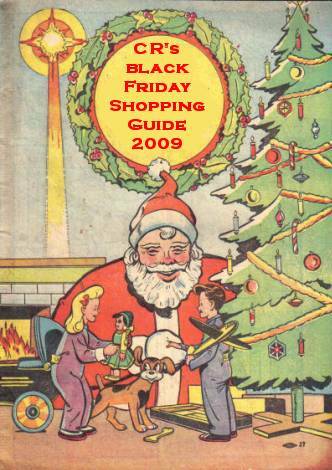 Tom Spurgeon has assembled his annual guide to the perfect Christmas present for a comics fan. It's a great, useful list, and I don't say that just because there's a CdS book on it (though that doesn't hurt). Me, I'd like almost anything on the list, especially the Herbie doll. Are there any Italian recipes for turkey? This may be Grandma's first appearance. 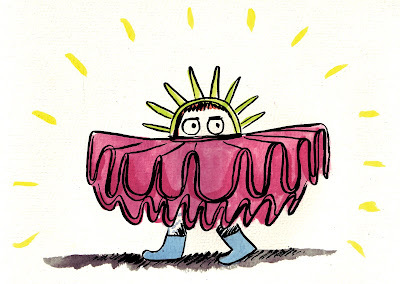 This was done as a Thanksgiving special for the Post Magazine in 2004. It's a little contrived, but I like it. This originally ran, in slightly different form, in the Washington Post Magazine. With an illustration by Gene Weingarten. Seventeen years ago today, my wife, Amy, and I were about to celebrate our first Thanksgiving as a married couple. We were going to serve a large feast on our new plates on our new table in our newly rented home for as many of our extended family as could make it. The night before Thanksgiving we went to a bar with friends and we had a most festive and enjoyable time, I personally enjoying it more than anyone else. When we got home, in hopes of coninuing my festively enjoyable time, I started dancing around like Fred Astaire would if Fred Astaire danced in his socks. 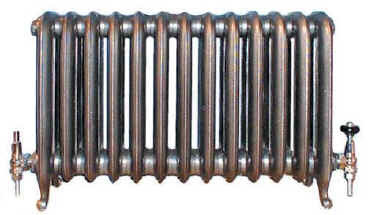 Our house was old and strangely shaped and it was heated by radiators, big iron monsters, all coils and ribs and flanges. The kind of fixture that would give sensitive children nightmares. I, as Fred Astaire would not, executed a kick that planted my foot squarely into the radiator in the hall, good and hard. Amy, seeing me suddenly rolling around on the floor, thought I was still enjoying myself, until I pulled my sock off. One toe was bent completely back, and since it was the middle one, it looked like my foot was giving me the toe, if you know what I mean. It was indescrabably funny, in a silent-film-comedy-trauma way. And it hurt like "the dickens". The dickens is when the entire output of Charles Dickens-all 15 hardbound novels, plus journalism, letters and ephemera-is simultaneously dropped from a height and hits you. The folks at the emergency room were extremely helpful and didn't laugh and didn't yell at me when I did some doughnuts with the wheelchair and knocked over the IV stand. But the nurse on duty did tell me an awful story about when he was in the Navy and won a $300 bet that he couldn't pull all the hairs off the top of his foot with tweezers without screaming. And they gave me some Tylenol 3, the kind with codeine, the kind that comes with the warning that not everybody reacts well to codeine. So that is how I ended up at the head of our table the next day, Thanksgiving Day, with my mangled foot elevated on another chair, presiding over our first Thanksgiving feast. And that is when, not ten minutes into the meal, I fould out I was one of the people who react badly to codeine. And it was Amy who quickly handed me a bowl, the fancy one that matched our new plates and was fortunately empty, for me to react badly in. It's been 16 years. The toe's still there, of course, though it's still bent a little funny. The house is gone, or at least so renovated it's unrecognizable, and good riddance; it was an astestos-clad eyesore and a menace. Somehow, subsequent family holidays have never quite matched that First Thanksgiving for intensity of emotion; not the Christmas of the Flaming Oven Mitt, or the Other Thanksgiving When the Fireplace Blew Up, or that Day or Two Before Easter When We Had to Evacuate Because of a Carbon Monoxide Leak That Almost Killed Everybody. The only downside is that, ever since I broke my toe that night, I've been forced to draw with my hands. 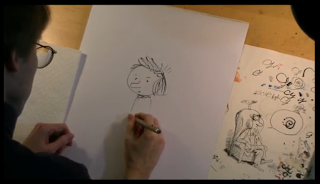 Cul de Sac Coloring Contest! Today at the Comic Riffs Blog Michael Cavna announces an exciting contest that will test the very fiber of your creativity, if your creativity is in fact fibrous. Details can be found here. Fan Art Saturday Falls On A Saturday This Week Again! This week we have two Very Special Friends of Cul de Sac - but aren't you all? (said in a Dame Edna Everage voice, please). First, Ms. Jennifer Hart of Arlington, who writes and hand delivers to us a perceptive and funny weekly newsletter and who also bakes us excellent cookies, somehow found the time to draw these two excellent images, both of which I wish I'd've thought of. This one, casting Petey as the Ghost of Christmas Yet to Come and Alice as the Ghost of Christmas Past, really cracks me up. Who would play Scrooge? Mr. Danders, of course. 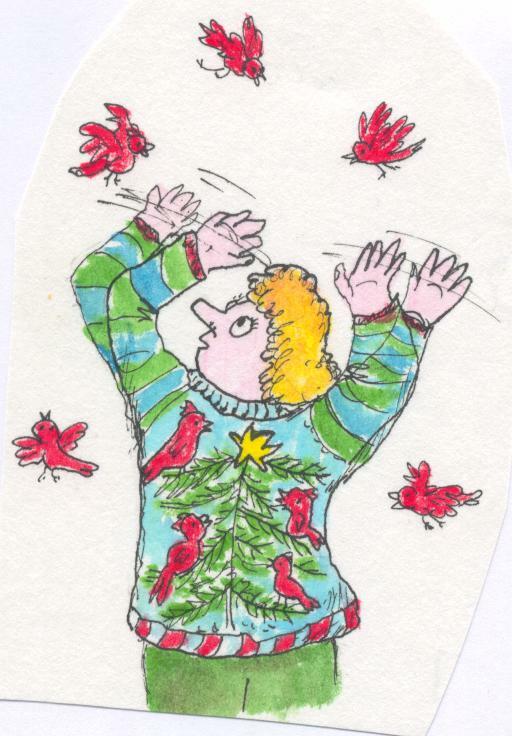 Here Mrs. Otterloop has some problems with her annual Winter Sweater, a theme I've visited a few times. And probably will again soon enough, but Jennifer got to this variation first, darnit. Mr. Diego Ceresa, the renaissance man, artist and translator whose work we've lauded on this blog before, sent in this vivid image of Alice If She Had Pupils. It's haunting in the same way an Andy Warhol painting would be, if Andy Warhol had ever had the foresight to paint Alice Otterloop. Mille grazie to Diego and Jennifer! I'm inspired, which I sure do need because I got a pile o' work to do. That nice man Tom Racine- cartoonist, podcaster, voice extraordinaire- called me the other day and we had a nice long chat. Et voila, it's available as a podcast over at the excellent Tall Tales Radio! Tom's the one who sounds like Superman, I sound like a helium addict who plays the kazoo, and not well, either. While you're over at TTR, please take the time to vote for Tom's mighty work at PodcastAwards.com. 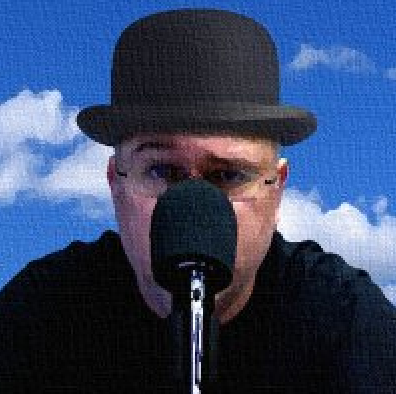 Did you know he's done 60 high-quality & informative podcasts? The man's indefatigable! And he looks good in a derby. 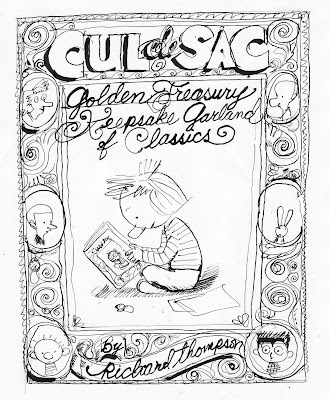 This is the first public glimpse of the cover rough for the Cul de Sac Golden Treasury Keepsake Garland of Classics, due to hit the shelves Spring of 2010. The Cul de Sac Golden Treasury Keepsake Garland of Classics will gather the complete contents of both previous Cul de Sac books, plus author commentary, drawing how-tos, grammar tips, suggestions for improved posture, recommendations for further reading and a favorite recipe for spoonbread, whatever the hell that is. Here we have two masterful examples of fan art. So masterful, in fact, that I'm considering passing the strip along to one of you people; I can't do this forever, you know. 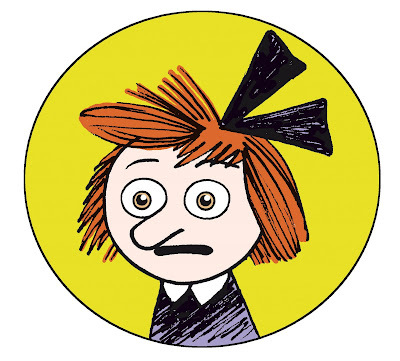 And then Cul de Sac would qualify as a "legacy" strip, making its position on the comic pages inviolable. I'd just keep 95% of the take, plus all rights into perpetuity. Deal? 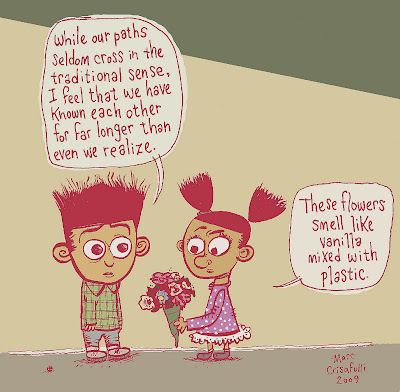 From our old friend the cartoonist & animator Marc Crisafulli comes this heart-warming scene of an unexpected romance between Nara and Beni, As Nara is the most mature and accomplished student at Blisshaven (being 4 1/2) and Beni is more competent than most, especially Dill, I shouldn't be surprised. Please note the liveliness of the line and the subtle yet fanciful color. Marc, take a bow! 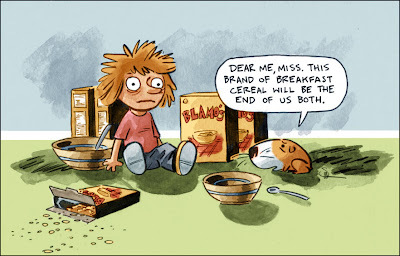 Here Mr. Evan "Doc" Shaner proposes a very likely explanation for the name Blammos. And he includes the redoubtable Mr. Danders, who I've sadly neglected for the last year. When I look at a piece like this it makes me wish I knew how to draw. Thank you, Doc, please take a bow! And thanks for the kind email (and my regards to your wife). 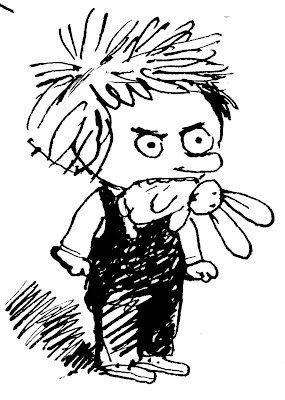 Here's a bit of today's strip; Alice at two, or The Feral Child. 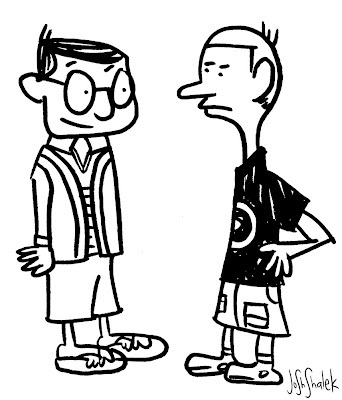 Here are two more excellent additions to our burgeoning collection of Fan Art. First, from the multi-talented triple-threat omni-directional Chris Eliopolous, this terrifying preview of what could happen if Petey should somehow stumble into the presence of the awful Uh-Oh Baby. Thanks, Chris! It's bone-chilling! Next, cartoonist, blogger, founder of Falling Rock State Park and longtime long distance friend of CdS Josh Shalek limns Petey and his own Uh-Oh Baby, the dread Ernesto. Truly horrifying, especially as Ernesto is based on a real person, or possibly two. Thanks, Josh! More TK, as we say in journalism.